Pure Planet Recycling offer a WEEE (Waste Electrical and Electronic Equipment) recycling service for businesses in London. We provide a secure and certified collection service for your end of life equipment. We recycle all types of waste electrical equipment in London, covering almost everything with a battery or plug. From IT equipment, office electricals through to fridge freezers. Equipment does not need to work or be of a certain age. Clients range from a small business in east London to a financial corporation in the City. So whether your business is North or South of the Thames, our collections cover the whole of the capital. All of our equipment is processed and recycled here in the UK. We also provide onsite WEEE storage containers for the safe storage of electrical waste for regular customers. Please contact us on 01234 315496 to speak to us about the WEEE you produce and how we can help. At our licensed recycling facility we recycle the equipment. If required data is destroyed and the process is documented. Pure Planet Recycling offers a fridge recycling service for business customers in London. Fridges and freezers contain hazardous components that require specialist treatment . 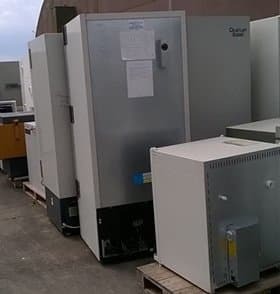 We recycle both domestic style and industrial fridges and freezers, air conditioning units and also dehumidifiers. We are an Authorised Treatment Facility (ATF) for electrical waste and recycle all types of electrical equipment. Our staff collect fridges and freezers from businesses, local authorities and schools across the capital. All refrigeration collections are accompanied by Hazardous Waste Consignment Notes. This allows for an audit-able recycling service for all items that we recycle. It details the number, weight and hazardous components of the material. So if you need to recycle a fridge or freezer in London call 01234 315496. Why Choose Pure Planet Recycling? For more information on how to recycle electrical equipment in London please call us on 01234 315496. Or, read more on our computer recycling in London and data destruction in London services.